Let Electacourse book your City and Guilds 18th Edition 2382-18 Exam for you. We work with City & Guilds centres around the country. Who can purchase this product? We expect you to have studied the 18th Edition Course with Electacourse or another course provider (see important information below). If you do not already have it, we strongly recommend you practice with the 18th Edition Online Practice before you register for the City & Guilds 2382-18 exam (18th Edition Online Practice is included in Electacourse 18th Edition Online courses). After completing the purchase of the booking you will receive an email containing a link to the exam registration form. The exam registration form asks you to declare your 18th Edition exam practice scores. If you have not purchased any Electacourse 18th Edition product (Course, Update Course, Online Practice): We can only take your exam booking for one of our Quick Book centres. The other centres are available only to Electacourse 18th Edition customers. If you are an Electacourse 18th Edition Online Course customer, you will have received a discount code for the exam in your course purchase email. Please check and use this code. NO EXCEPTIONS. We CANNOT take an exam booking without either 1 or 2 being satisfied. Where are our exam centres? The Electacourse exam partner centres are located in London – (Ealing, Isleworth, Barking), Bradford, Manchester (Heywood), Nottingham Stockton, Aberdeen, Basingstoke, Birmingham, Brigg, Bristol, Dundee, Exeter, Glasgow (Motherwell), Gloucester, Hull, Leicester, Maidstone and Watford (M25), Electacourse can offer you an exam centre convenient for you to take the 18th Edition exam C&G 2382-18. All exam centres are fully accredited by City & Guilds. When you pass your exam you will receive your 18th Edition qualification certificate within about three weeks of passing the exam. All other centres have limited availability, are available only for Electacourse students and require more than 8 weeks notice. From time to time the choice of Electacourse exam partners changes. If your choice of centre made at time of purchase, is no longer available we will offer you an alternative at time of registration. You can see an up-to-date list of all Electacourse exam partner centres on the Exam Centres page. The 18th Edition exam City & Guilds 2382-18 is an open book exam, this means you must take into the exam room with you a copy of (Blue Book – 18th Edition). Electacourse recommend you buy the book from Amazon, it is the cheapest. Remember, do not make any pencil marks or notes in the Wiring Regulations. If you have marked the book you will not be allowed to take the book into the exam. You can put Post-It notes in the book. Remember to take a calculator with you into the exam – you cannot use your phone as a calculator. 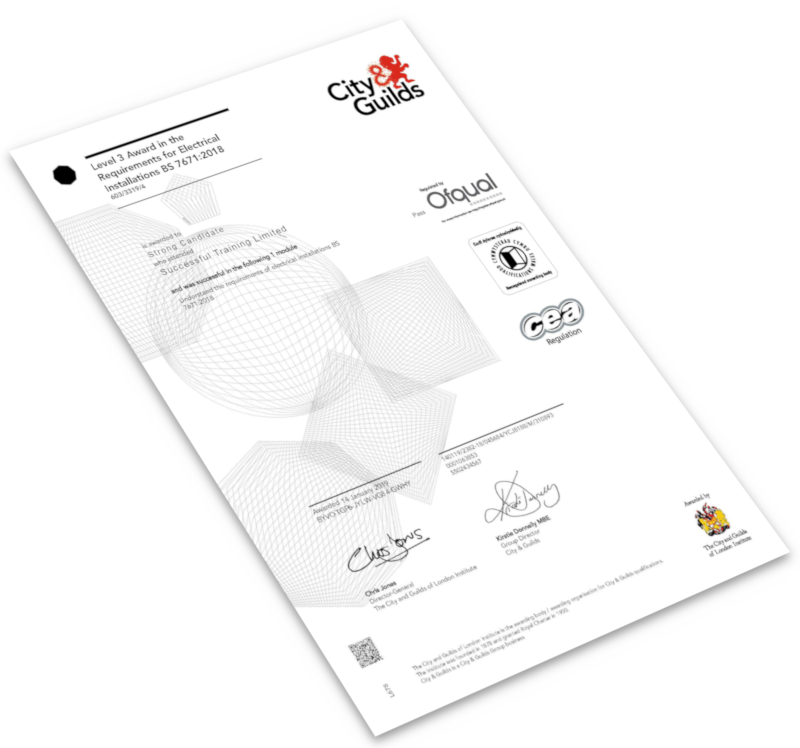 If you have passed the exam you will receive your City & Guilds certificate directly from the Electacourse exam partners, normally within three weeks of your exam.